There once was a time in my life where I was such a terrible cook that if I did not have absolutely, exactly every ingredient as written on a recipe, I would not even be able to attempt it. Out of pepper? No way I'm trying that recipe...that could be seriously important to the results! And truly, I'm not exaggerating AT ALL. As I've experimented more and more over the last few years, I've learned that almost everything has a substitute, and I can most always make a recipe even without all the listed ingredients. It's just been a learning process. 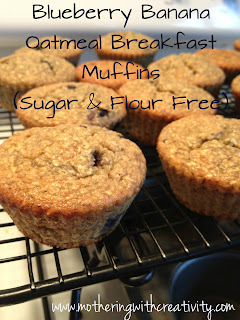 So, when I stumbled across this recipe for Banana Oatmeal Breakfast Muffins on Pinterest (using NO sugar and NO flour), I was all over it, even though I didn't have everything exactly as on the list. Let me tell you...I am sooooo stinkin' glad I went for it! These were amazing (and gone by the end of the day). Preheat oven to 400F, and line a muffin pan with cupcake liners or spray it with non-stick spray. I use my Reusable Silicone Baking Cups (they wash clean in the dishwasher, saving me lots of money on all my muffin baking!). Place 2 1/2 cups oats (I use old fashioned) in the food processor (or blender if you don't have one). Pulse for 10-15 seconds. Then add in: 1 cup vanilla yogurt or greek (I specifically used Trader Joes organic Vanana flavor-our favorite), 2 eggs, 1/2 cup honey, 1 1/2 tsp baking powder, 1 tsp baking soda, 1 tsp vanilla, and 2 ripe bananas. Turn the processor back on and process until everything is looking pretty smooth and well mixed. Fold in 1 cup blueberries (fresh or frozen will both work fine). Fill cupcake liners 2/3 full. I was able to make 18 muffins with my batch. Bake for 18-20 minutes at 400F or until a toothpick comes out clean. These are seriously so delicious! And sugar and flour free? Double bonus! All three of my children enjoyed them, too. YUM! I'm going to try these this weekend!